The tea state of India, Assam is a very popular travel destination amongst tourists. The natural beauty complemented with pleasant climatic condition win the heart of guests. Thus, to ensure a memorable vacation in Assam, there are numerous luxury resorts in and around Assam. Thus, there also are luxurious golf resorts that are praised for excellent facilities and exceptional services. Massive golf courses win the heart of guests interested in playing a game of golfing. The sport could be enjoyed by both amateurs and professionals. The rooms of the resorts are equipped with all modern facilities to ascertain utmost comfort to the guests. 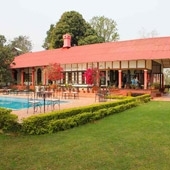 Kaziranga Golf Resort is one of the sought-after resorts in Assam for featuring 18 hole, Par 71 Golf Course. The resort is also regarded as premium and futuristic abode for enjoying a vacation in a colonial tea setting.